Original Editors - Carolyn Little & Genny Tibbs from Bellarmine University's Pathophysiology of Complex Patient Problems project. 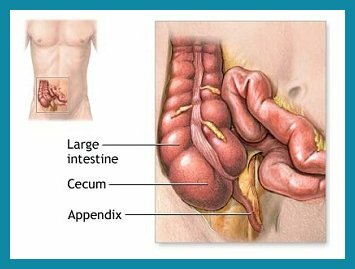 The appendix is a small finger-shaped pouch that projects out from your colon on the lower right side of your abdomen. Appendicitis is described as the inflammation of the vermiform appendix that may result in necrosis and perforation. Obstruction, inflammation, or infection can cause the appendix to rupture leading to peritonitis. This condition usually requires surgery as its medical management due to the fact that acute appendicitis can often be life threatening. Thus, appendicitis is the leading cause of emergency abdominal operations. Upon histological review, acute appendicitis can be divided into simple, gangrenous, or perforated categories. The lifetime risk of appendicitis in the United States is 9% for males and 7% for females. It is most commonly diagnosed in adolescents and younger adults. Overall incidence of this condition is declining for reasons not well known. It is suggested that increased dietary fiber intake and improved hygiene could be contributing factors to the decrease in appendicitis cases. The location of pain may vary, depending on age and the position of the appendix. For example, young children or pregnant women may have appendicitis pain in different places. Atypical appendicitis may not present with the classical signs and symptoms listed above. These abnormal symptoms could present with decreased pain intensity and localization, less discomfort experienced when coughing or walking, and/or pain that localizes to the left side of the body. In older adults, confusion may be the first sign of an acute event. An appendiceal abscess which sometimes forms around a burst appendix. Peritonitis if the appendix burst and infection spreads. Medication use is going to depend on the severity of the case. If infection or an abscess is present oral antibiotics maybe prescribed before an appendectomy. Also, broad spectrum IV antibiotics may be prescribed post operatively. Pain medication will be prescribed following an appendectomy. Diagnostic testing is often indicated for individuals suspected of having appendicitis. Medical imaging such as CT scans, sonograms, or abdominal X-rays are used to help confirm possible appendicitis. Additional laboratory tests utilized are urine analyses, to make sure that a urinary tract infection or a kidney stone isn't causing the pain, or complete blood counts. Patients who present with typical appendicitis will have an elevated WBC count > 20,000 mm3. Physicians will also perform a histological examination of the resected appendix for further confirmation of the condition. Iliopsoas and obturator muscle tests are administered to rule out potential abscesses or insults to muscle integrity. Appendicitis is thought to be caused by a combination of obstruction and bacterial infection. In 50% of appendicitis cases, there is no known cause. Approximately 1/3 of appendicitis cases are obstruction related (tumors, fecaliths, parasites, or lymphoid hyperplasia). Obstruction of the appendix causes inflammation of the mucosa lining. Swelling of the glandular tissue leads to distention of the appendix and increased intraluminal pressure. When the intraluminal pressure exceeds venous pressure ischemia to the local tissue occurs. As neutrophils accumulate, microabscesses produce additional ischemia increasing the likelihood of perforation within 24-48 hours. Ulceration of the mucosa allows invasion of intestinal bacteria and infection of the peritoneal cavity can occur. Other causes of this condition include Chron's disease of the terminal ileum, ulcerative cholitis, and tuberculous enteritis. Appendicitis can cause a variety of gastrointestinal manifestations that are influenced by the patho-physiologic characteristics of the underlying disease process. This can include peritonitis which is inflammation of the peritoneum that lines the inner wall of the abdomen and covers most of the abdominal organs. • Laparotomy: Laparotomy removes the appendix through a single incision that is about 2 to 4 inches (5 to 10 centimeters) long in the lower right area of the abdomen. • Laparoscopic surgery: Laparoscopic surgery uses several smaller abdominal incisions and special surgical tools fed through the incisions to remove the appendix. Laparoscopic surgery leads to fewer complications, such as hospital-related infections, and has a shorter recovery time with less scaring. 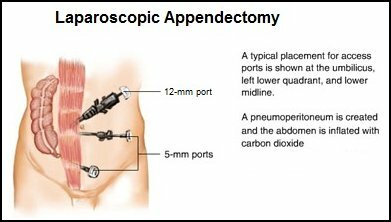 If the appendix has ruptured and infection has spread beyond the appendix or if an abscess is present, immediate surgery through laparotomy may be required to clean the abdominal cavity and remove the appendix. If the infection is not treated peritonitis can develop. If the infection spreads to the blood sepsis can develop. One or two days is usually spent in the hospital after an appendectomy. Another systematic review published in 2011 also found similar inconclusive results regarding the efficacy of antibiotic therapy on acute appendicitis. In this study, 489/741 patients underwent antibiotic therapy. Although the number of individuals who developed complications were significantly higher in the surgery group, the percentage of experiencing acute appendicitis within the first year follow up and immediate 48 hour surgery varied from 10.5 to 36.8% and 5 to 47.5%, respectively. Currently there is no research available on physical therapy management of appendicitis. This condition is visceral in nature and is managed most effectively by surgical procedures. Physical therapists have an important role in recognizing signs and symptoms of this disease so patients can seek medical attention in a timely manner. It is imperative that physical therapists take detailed subjective histories and conduct abdominal screenings accurately so appropriate referrals can be made. Physical therapist may see patients post appendectomy. Therapist should be aware of the incision site between the anterior superior iliac spine and umbilicus. Patient education would include avoiding strenuous activity, supporting the abdomen when coughing, and breathing exercises. A recent case study by Gershfeld, Sultana, and Goldhamer in 2011 reported positive outcomes for a patient with subacute appendicitis. In this study a 46 year old man was medically supervised on a water only fasting program for seven days. The patient then followed a strict low sodium and low fat diet after he was reintroduced to foods. He was further advised to continue the diet after leaving the medical facility. The participant reported decreased right lower quadrant pain at three months, one year, and two year follow ups. ↑ 1.0 1.1 1.2 1.3 Mayo Clinic. Appendicitis. http://www.mayoclinic.org/diseases-conditions/appendicitis/basics/definition/CON-20023582. (accessed 18 Mar 2014). ↑ 2.0 2.1 2.2 2.3 2.4 2.5 2.6 2.7 2.8 2.9 Goodman CC, Fuller K. Pathology Implications for the Physical Therapist. 3rd Edition. St. Louis, Missouri: Elsevier Saunders, 2009. ↑ 3.0 3.1 3.2 Goodman CC, Snyder TK. Differential Diagnosis for Physical Therapists: Screening for Referral. 5th Edition. St. Louis, Missouri: Elsevier Saunders, 2013. ↑ Spirt MJ. Complicated intra-abdominal infections: a focus on appendicitis and diverticulitis. Postgraduate Medicine. 2010;122(1):39–51. ↑ 5.0 5.1 5.2 5.3 National Digestive Diseases Information Clearinghouse (NDDIC). Appendicitis. http://digestive.niddk.nih.gov/ddiseases/pubs/appendicitis/index.aspx (accessed 18 Mar 2014). ↑ PubMed Health. A.D.A.M. Medical Encyclopedia. Appendicitis. http://www.ncbi.nlm.nih.gov/pubmedhealth/PMH0001302/. (accessed 18 Mar 2014). ↑ 8.0 8.1 Wilms IMHA, de Hoog DENIM, de Visser DC, Janzing HMJ. Appendectomy versus antibiotic treatment for acute appendicitis. Cochrane Database Reviews 2011;11:1-34. (accessed 17 March 2014). ↑ Ansaloni L, et al. Surgery versus conservatice antibiotic treatment in acute appendicitis: a systematic review and meta-analysis of randomized control trials. Digestive Surgery 2011;28:210-21. (accessed 17 March 2014). ↑ Gersheld N, Sultana P, Goldhamer A. A case of nonpharmacologic conservative management of suspected uncomplicated subacute appendicitis in an adult male. Journal of Complementary Medicine 2011;17(3):275-77.http://www.ncbi.nlm.nih.gov/pubmed/?term=a+case+of+nonpharmacological+conservative+management+fo+suspected+uncomplicated+subacute+appendicitis+in+an+adult+male. (accessed 18 March 2014).